The D.Module2.C6657 is based on the Texas Instruments Keystone dual-core processor TMS320C6657. The Keystone multicore DSPs are characterized by huge computational power and fast serial interfaces. 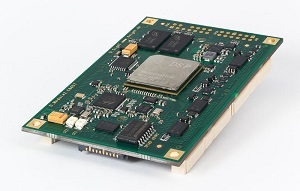 The D.Module2.C6657 is perfectly suitable for radar applications, nondestructive material inspection, machine vision and software defined radio (SDR). An optional FPGA for data preprocessing is easily interfaced through Serial Rapid IO (SRIO), PCI express (PCIe) or via the fast Universal Parallel Port (uPP). Gigabit Ethernet enables network integration for control, remote maintenance and data streaming.